In case you hadn’t noticed, we’re in the middle of a major craft beer revolution right now in Toronto. Between the LCBO, local beer bars, and the new microbreweries popping up all over town lately (OK, fine, maybe that’s mostly just in the Junction), Toronto beer drinkers are pretty spoiled for choice when it comes to what’s on tap these days, as indie breweries have officially gone mainstream. But there’s no need for FOMO — as a public service, we’ve put together a list of where to find some of the city’s best craft breweries (and what to try once you get there). Calling Bellwoods one of Toronto’s most popular craft breweries might be underselling things. The small brew pub-turned-craft brew hotspot has been luring beer lovers to the Ossington strip in droves ever since it first opened in 2012, but their brand-new brewing facility at Keele/Lawrence should help ensure supply’s able to keep up with demand. 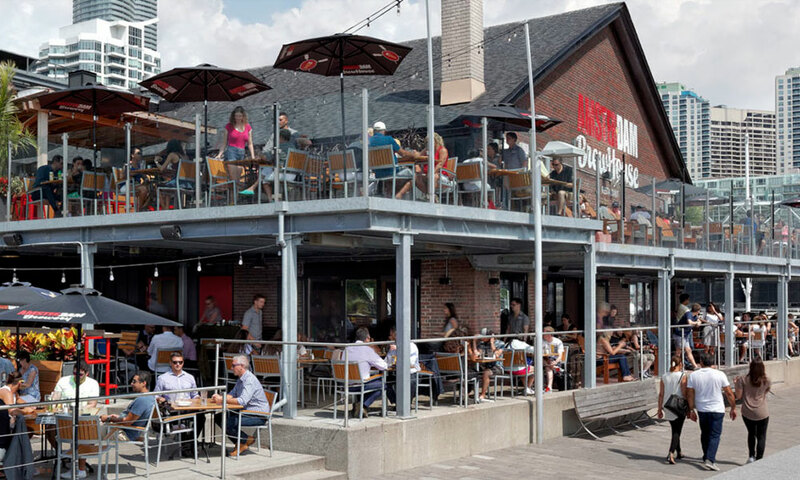 The city’s oldest independent brewer, Amsterdam has been serving up craft beers to Torontonians since 1986, well before craft was a “thing.” Now, 30 years later, they’ve got a brewery in Leaside, a harbourfront restaurant on Queens Quay, and a loyal following that goes back decades. Here’s to another 30 years. Try: The Boneshaker IPA, an unfiltered strong beer that’s got taste to match. Started by a homebrewing husband-and-wife team who turned pro in 2013, this baseball-themed Leslieville brewery quickly rose through the ranks of the local Toronto craft scene. Now, Mark and Mandie Murphy make an entire roster of beer worth cheering for (or with – Go Jays! ), from hoppy IPAs to rotating seasonals. Try: The Eephus Oatmeal Brown Ale, one of the brewery’s all-time fan favourites. When Mill Street Brewery co-founder Mike Duggan set out on his own in 2007, beer lovers followed, and the award-winning brewmaster’s latest venture certainly hasn’t disappointed. You can find Duggan’s new signature classics on LCBO shelves, and its rotating lineup of specialty beers in house at the Parkdale brewery. Try: The No. 9 IPA, Duggan’s hallmark pale ale. The Junction has quickly become the epicenter of Toronto’s burgeoning craft beer scene, and Junction Craft Brewing has been leading the charge ever since it opened in 2011. You can catch its popular train-themed beers – a nod to the neighbourhood’s history as a West Toronto rail hub – at the LCBO or their dedicated tap room. Try: The award-winning Brakeman’s Session Ale. Despite only being founded in 2014, Henderson’s Toronto roots run deep, from its name – an homage to Robert Henderson, the city’s first brewer – to its award-winning Henderson’s Best, a modern reimagining of a classic Toronto bitter. But that’s not all: they also release a new 6ix-inspired beer monthly as part of their limited-edition Ides lineup. Try: Henderson’s Best, a beer that lives up to its name, and then some. This sibling-run microbrewery has generated quite the cult following since it first opened in 2015, spurred on by the brother brewmasters’ innovative offerings, small-scale batches, and somewhat hidden Geary Ave. location. As a result, their bottles go fast, but they’re well worth the extra effort it takes to track them down. Try: The Paradise Lost series, an ever-changing selection of kettle sours. As one of the GTA’s oldest craft brewers, this two-time Canadian Brewery of the Year has been putting out consistently excellent beers for going on three decades now. GLB refuses to simply rest on their laurels though, putting out innovative new limited releases as part of their ongoing Tank Ten project. Try: Any of the latest Tank Ten offerings, or their classic Canuck Pale Ale. If you’re tired of drinking mass-produced beer-flavoured water, you’ll want to check out this popular Junction alehouse. In addition to the small indie brewery’s four flagship offerings, its rotating taps are always changing – keep an eye out for Fates & Furies, a series dedicated to reviving now hard-to-find brews. Try: The Barnyard Belgian IPA, a hybrid that combines the best of both iconic styles. The Junction’s got new microbreweries sprouting up seemingly every other month. And while Halo may be the newest new kid on the block, homebrewers-turned-brewmasters Callum Hay and Eric Portelance have already earned quite a rep among Toronto’s beer lovers for their wide range of experimental brews and “basement to brewery” story. Try: The Tokyo Rose, a rosehip-flavoured saison.